Preface: The following information was submitted to me in 2000 by a traveler named Alexander. Having been to South Africa and Botswana in 2008, his tips and warnings still hold true. The photos are mine. I lived in Southern-Africa, including South-Africa, until 1995, and traveled the whole area extensively. Also, I visited South-Africa, Swaziland, Namibia, and Botswana last April. There are many group-travels available, but this is mostly info for individual travelers. The price for air-tickets varies strongly and one really has to look around. We found a Chinese travel agency in Toronto, and paid Canadian $1,150 for the round trip with Dutch airline. Plus we arrived in Johannesburg are were allowed to depart from Capetown. South-Africa and Swaziland: I am sort of a backpacker, so we stayed in international hostels for about CDN$10 per night per person (its a bit of a myth that they only have bunk sleeping). Mostly, we had our own bathroom. Usually, we booked the same day, but not always, and we were never turned back. One can benefit from hostels also by meeting other international travelers and we made friends from all over the world. Also, since their interest is not in doing business, information on places they had been to can prove very valuable. I don't quite see the difference in comfort between BB and hostels, but there are plenty of small family owned guesthouses. Hotels can cost CDN$100 and over, but they also have guesthouses and hostels. Originally we thought to book from Canada, but did not get good offers, so we booked through a Johannesburg hostel and rented an insurance-wise fully covered small Toyota hatchback for Rand 250 per day with unlimited kilometers. April and May are very good months to visit the area. Usually the summer rains are over (we had two days of rain shortly after our arrival and then sunny weather for three weeks), and the temperatures are around 22 to 27 degree Celsius. May evenings tend to be cool and having a sweater or jacket on hand is advisable. Although, most parts are semiarid bush veldt, there is still an enormous diversity: South-Africa's southern and eastern Cape, and Swaziland are partly very lush. Botswana, and many other parts are dry, but one can experience outright Sahara-like desert in Namibia, mountains in many parts of South Africa, including some snow on the top of the Drakensberg (Dragon-Mountains) near Lesotho, and savanna in the Karoo. Nature lovers will definitely get their fill. Western South Africa is uninteresting. Visiting the Kruger National Park is simply a must, but it requires a few days stay and patience to find all the animals, as they are not on display. We saw elephants, rhinos, hippos, leopards, cheetahs, and the rest. The lions eluded us, but we only stayed there for one night. The park is well-run, and one can stay in bungalows or camp. Restaurants and picnic areas are plentiful. The signs “Do Not Leave The Car” should be taken seriously. Every park is absolutely safe, if travelers adhere to the rules. The roads are excellent and the whole park is accessible by any 2-wheel drive. However, for people like me the Kruger is a bit too tame. 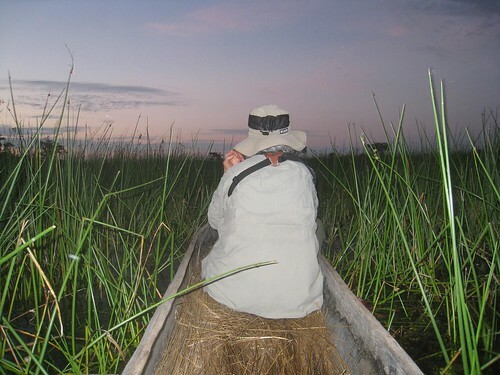 I lived in Botswana for a while and worked in the Chobe National Park, where I helped out conducting tours for individual travelers. This park is the real Africa, but requires a 4-wheel drive. Sunsets at the Chobe river are second to none, and in the morning on can watch herds of 40 to more elephants. Incidentally, Richard Burton and Elizabeth Taylor remarried at the Chobe Lodge (very expensive in the range of CDN200 per night and upwards). 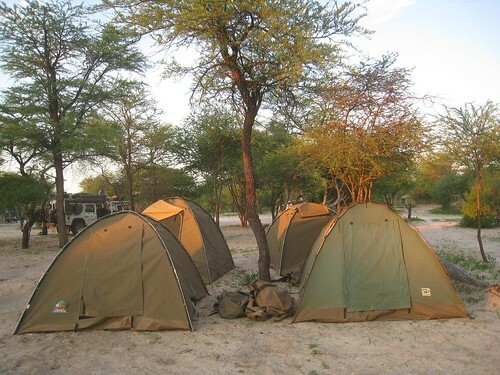 Attached are the Moremi Game Reserve and Savuti, which is lion country, and the Okavango Swamps, also a must, if one is in the area. Staying in tents at night is absolutely save. As long as the tent is kept closed(!!! ); i.e. zip up! No animal will break into a closed tents. The main problems of city slickers is that they walk too fast in the bush. Under normal circumstances no animal, including lions will ever attack a human being. Yes, there are snakes, but, if you walk at leisure and give animals time to get out of your way, they will do so. If Namibia is on the menu, one can find some flora nonexistent anywhere else. An extremely and ruggedly beautiful country. Interesting are the Namibia Desert, in the South the Fish-River Canyon, but every other part is a unique experience too. Since international flights end in Joh'burg, it cannot be completely avoided, but one should make arrangements to be picked up from the airport. There is a tourist office in the arrival hall where one can book a room from hostel to hotel, and even hostels pick up their guests. There are also car rental agencies, but I suggest to rent a car once you are at the hotel; i.e. one can get a better price. Coming from North-America it takes 2 nights to get there, and one night on the return flight. There is nothing to see in Joh'burg so one night might be amble enough. Durban used to be a fine city, but it is no longer safe there either. Not as bad as Joh'burg, I don't advise taking evening walks. 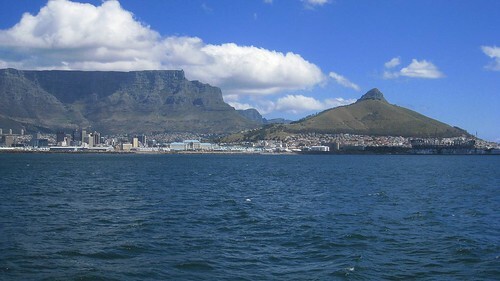 Although one has to be careful in any city (meaning don't be the obvious tourist and so invite mugging) Capetown, East London, Port Elizabeth are as save as any city in North-America; and they are beautiful, especially Capetown with its rich history whowing in its architecture. All 3 of them are on the coast, and their beaches are second to none. Interesting inland cities are Pretoria, Ladysmith, Pietermaritzburg, and Rustenburg (near Sun City and Lost City). If in Namibia visiting Windhoek with its German colonial architecture and “Still” German Beer gardens, Swakopmund with the same to offer, but in the Namibia desert, plus the coast, are a unique and unforgettable experience. Both cities are safe, as is the rest of Namibia. Gaborone, the capital of Botswana, is extremely dirty, overpriced, safe, except for stealing, and there is nothing to see. Swaziland's cities of Manzini and Mmabane are safe and interesting, as is the whole country. As a kingdom it has a lot of traditional life-style to show, which one cannot experience in South-Africa anymore, except on the “Tourist-Stage.” Simply, although an island within South-Africa, Swaziland is beautiful, definitely worth a visit, and within less than a day's drive from Joh'burg. Definitely worth while visiting are typical Afrikaner towns (Dutch) in the Cape and in Natal. They are likewise a unique experience. Thanks for posting this Dave! I'm currently planning my trip which is looking to start in this area in March so it's been useful. Sure thing, and don't forget I spent 2 months in South Africa so there's plenty in the old GoBackpacking Archives, which can be searched by month (Oct-Nov 08 for S. Africa) or Category (From Abroad). I'm planning on doing a trip to Africa late next year, so I guess I'll be searching your archives at some point for information. Great photos, Dave, especially the one with the lions! Ahhh you too! It's a fascinating area – I look forward to spending more time on the continent. Paul Theroux's Dark Star Safari is a great book about traveling overland from Cairo to Cape Town. Thanks so much for including GoBackpacking in your list! Check out http://www.ustaycheap.com for hostels and budget hotels. like the blog hows it goin? Thanks for your insights. This is a really intriging region for my wife and I. Would you say that renting a car is necessary for this region? Is it possible to just use public transport? I don't like the idea of driving/ being responsible for a car in a foreign country. The mokoro ride and safari look great! Do you do any wildlife photography? Hey Blake, you can definitely use public transport in the region, though South Africa's will be far more reliable than the poorer countries I imagine. Minivans are very popular in Africa…..and I've heard people talk about taking tons of them to get from one destination to the next. I've never done any wildlife photography per se, but when I see animals I do my best to capture them! It's easier to do in a place like Kruger Park where there's a high density of them. Or in Botswana which is overrun with elephants. I think if you put yourself in the right places, the photos almost take care of themselves. Overrun with elefants! That's great. Minivan: Is it cheap? Is it prone to burglery like the thai tourist minivans? Thanks for all the info. I'm a huge Lonely Planet fan, but word of mouth is always more reliable. Appreciate the time, friend! I'm not sure about the cost of minivans – I only took a few and it didn't seem bad at all. Remember, this is the way the locals are getting around – they're not some special tourist service. That means it is a matter of whether you're being charged a higher, foreigner rate, which is possible a lot of the time. I don't think the minivans are too prone to burglary – you'd probably have your pack inside, or if it is on the roof, it's easy enough to keep track of (compared to a full size bux). Great advice! I dont think you left anything out! Nice post! Like most South Africans, I had no idea about Lesotho until I went back home a few months back and decided to check it out… went horse trekking through Malalea Lodge overnighting in a Basutho village and it was a fantastic experience! Highly recommended! Hi Tim – thanks for stopping by. I wish I could've spent more time in Lesotho. I only managed to do a drive up the Sani Pass and a short hike, but it was beautiful (until thunderstorms erupted!). I really want to visit Namibia….One of the beautiful destination!!! Hey Dave……You have made one another fan here….i am now becoming quite a regular reader of your posts!!!!…. Outdated, and generic advice. And some parts are just basically false, nothing to do or see in Joburg – cleary the advice of a tourist who flits from hotel to hotel and resort pool to backpacker bar. I’d look a little further afield if looking for travel advice on SA and Swaziland.